28 February-4 March 2013. 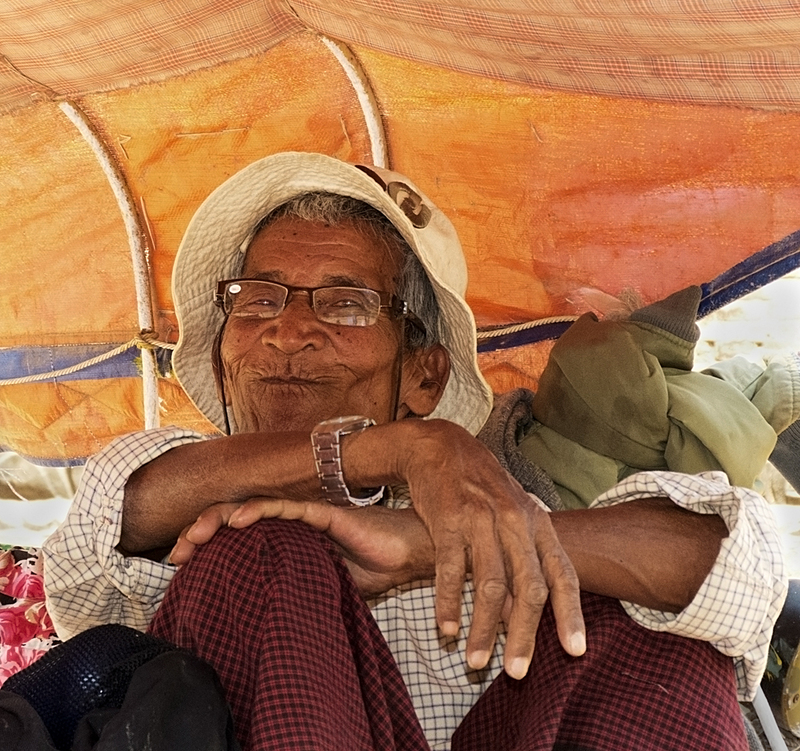 Bagan is all about the temples and pagodas, but I’ll start with the puppets, and the people. 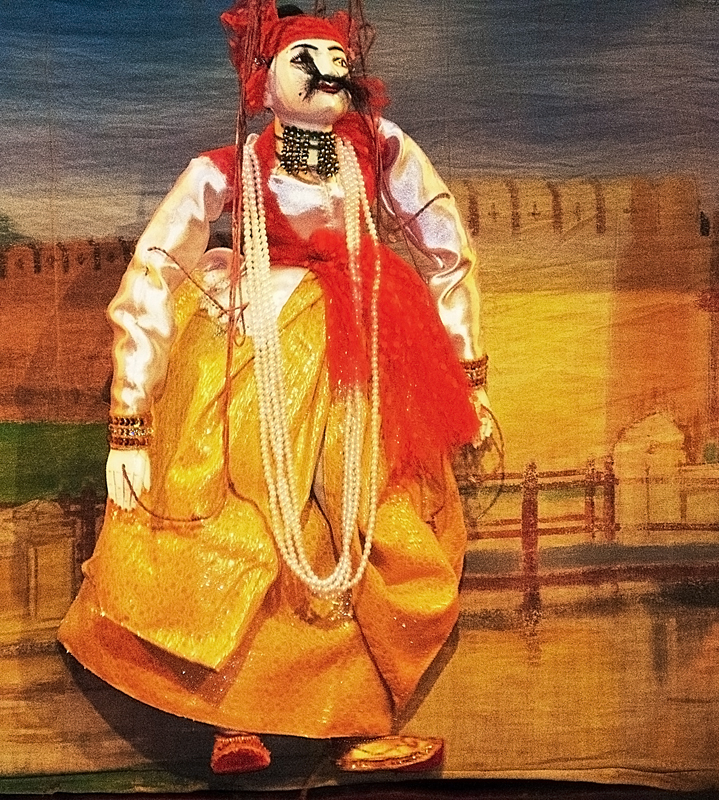 Marionettes, string puppets, first became a form of entertainment in the royal court in the 1700’s and the art form flourished for about a hundred years under royal patronage, until British colonization in 1885. It was revived in the late 1990’s under the patronage of one of the generals of the ruling Junta. 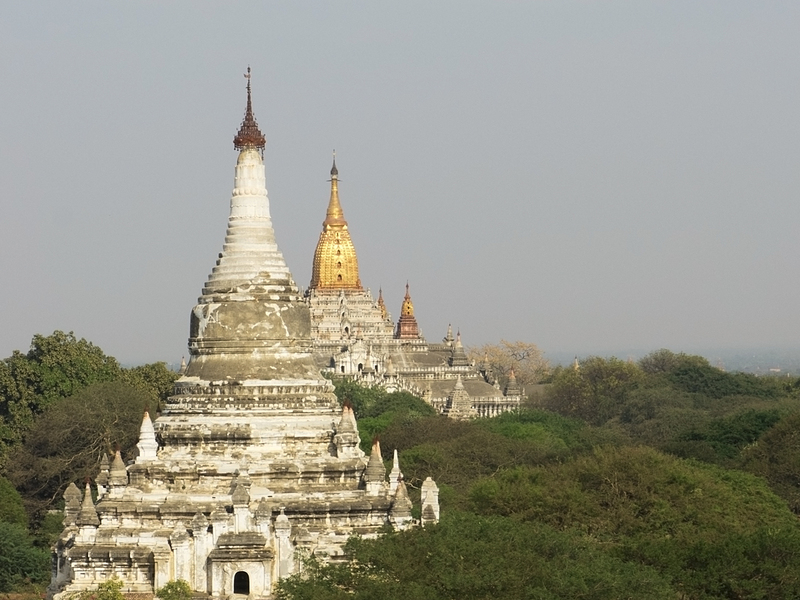 Apparently it is as popular with the people of Burma as it is with tourists. 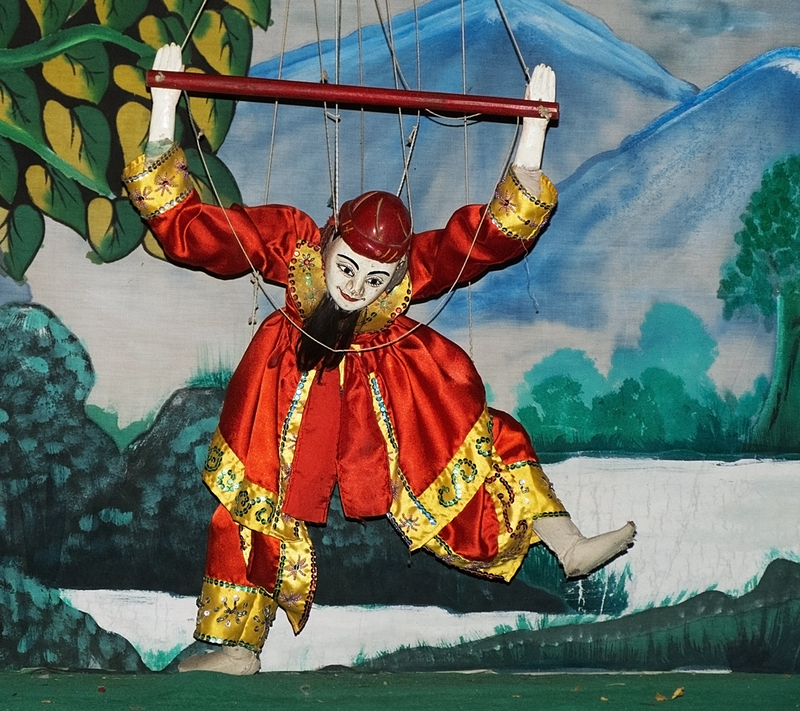 The same characters appear in each troupe, and it was interesting to see many of the same characters in the puppet shows as we saw in the traditional dance performance in Yangon. And what a cast of characters! Kings, queens, princes and princesses, the alchemist, the old man and the old woman, the monkey, the ogre, the Prime Minister, the dragon, the serpent, the horse, the elephant and the spirit medium! and many more. They are a form of pure whimsical entertainment, and the puppets were used then, as now, to convey political messages, since the puppets can say and do things a person may be punished for. It can be a clever covert way to broadcast a message of discontent or rebuke. 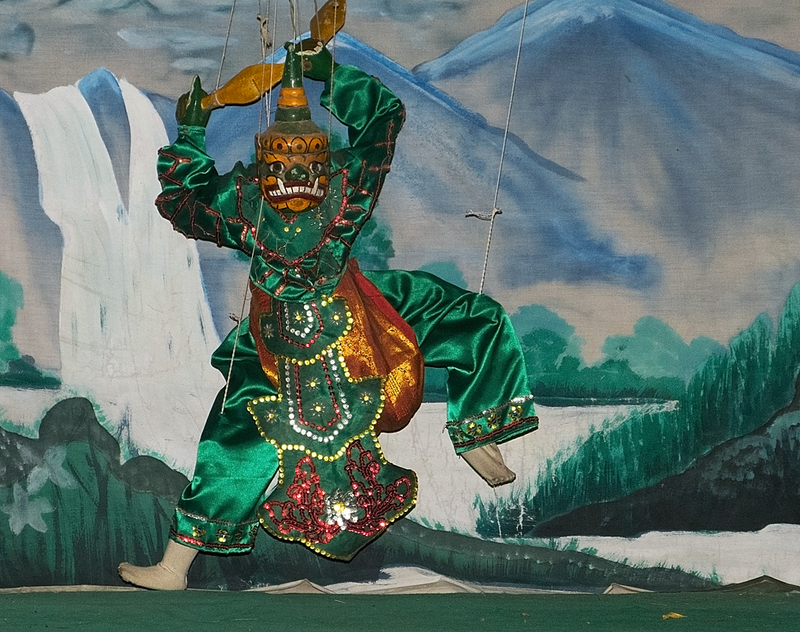 We saw a performance with a full troupe of puppets and puppeteers in Mandalay. A smaller troupe performed every night during dinner at our hotel in Bagan. Apart from being delightfully entertained it was a great opportunity to finally get some good photos. 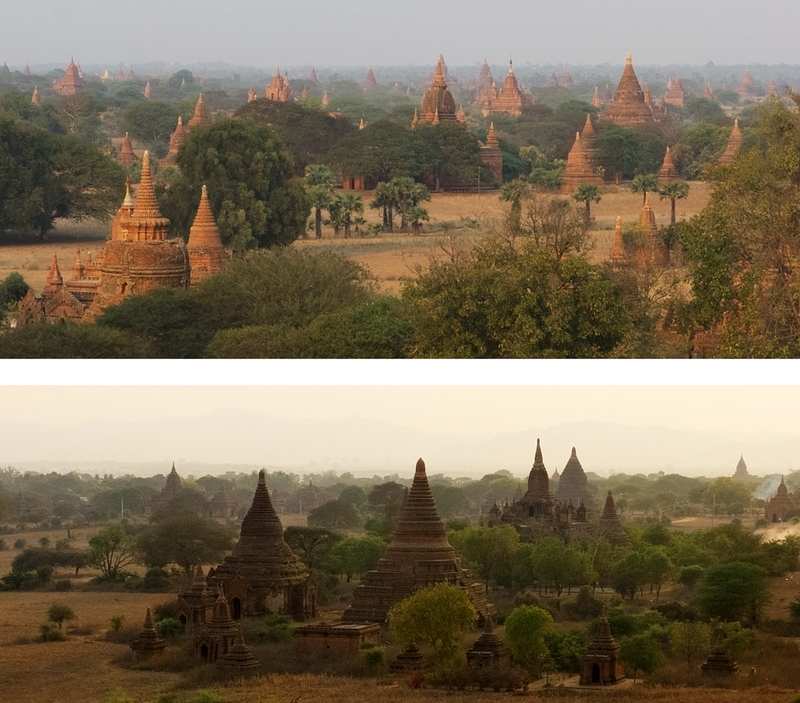 The first two were taken at the show in Mandalay in a darkened theatre, the following three in daylight in the open-air dining room of our hotel in Bagan. In Mandalay we’d walked to the theatre and had taken our headlights with us knowing the return journey would be after dark. By some miracle we found a trishaw driver who actually had his own headlight strapped around his head. Mostly they ride in the dark with no lights, and nothing much in the way of streetlights. Sigh. Anyway this guy had a headlight. He said a tourist had bought it for him. When we pulled out our headlights he doubled up with laughter. He’d never seen anything like it. Tourists with their own headlights! Honestly I thought he was going to choke on his betel nut. He was literally doubled over and trying not to dribble. We never did understand why it tickled him so but it was pretty funny seeing him laugh like that and not lose his wad of betel nut at the same time. 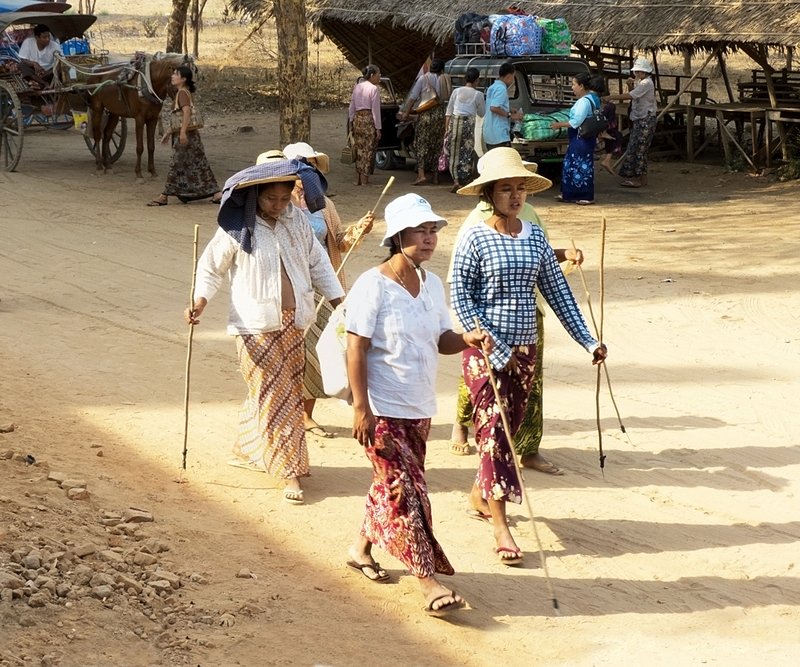 Trishaws in Burma have two seats, facing back to back. Our headlights have a bright white light at the front and a flashing red light at the back. Don sat facing forward, and I sat facing backward with my headlight on backwards thus becoming the flashing red tail light of our vehicle. Only one scary moment when I thought a motorbike was going to drive right up into us but swerved at the last minute. A frisson of adrenaline there for a moment. The trishaw driver told us that a couple of years previously he’d been caught with a fifty dollar bill that he’d been given by a tourist. He was jailed for two months. He said that now it was okay for him to have US currency. Tourism has grown so much, just in the last two years, that things like that are no longer considered suspicious. We had a day in Bagan to be flaneurs. We set out from our hotel with a map, and figured if we just kept walking “that way” we’d come to the river. We got to the end of the road, we had to kind of duck around a building and under some trees, and there we were at the river, at a village on the river bank, at a whole other part of Bagan, at “real life” Bagan as opposed to tourist Bagan. A lovely man came and spoke to us, and took us into the house of a relative who showed us photos of a long-deceased relative who must have had gigantism; as much an anomaly in their world as ours. This woman must have been well over seven feet tall, and they showed us her sandals that were about eighteen inches long, and a photo of her hand with a normal sized adult hand holding it. The woman showing us all these things didn’t speak any English. She was soft and gentle. Her house was wooden, and a bit messy and cluttered. The man asked us to give her a small payment for showing us her unusual relative. We sat by the river with him for a while. He said he was an artist. 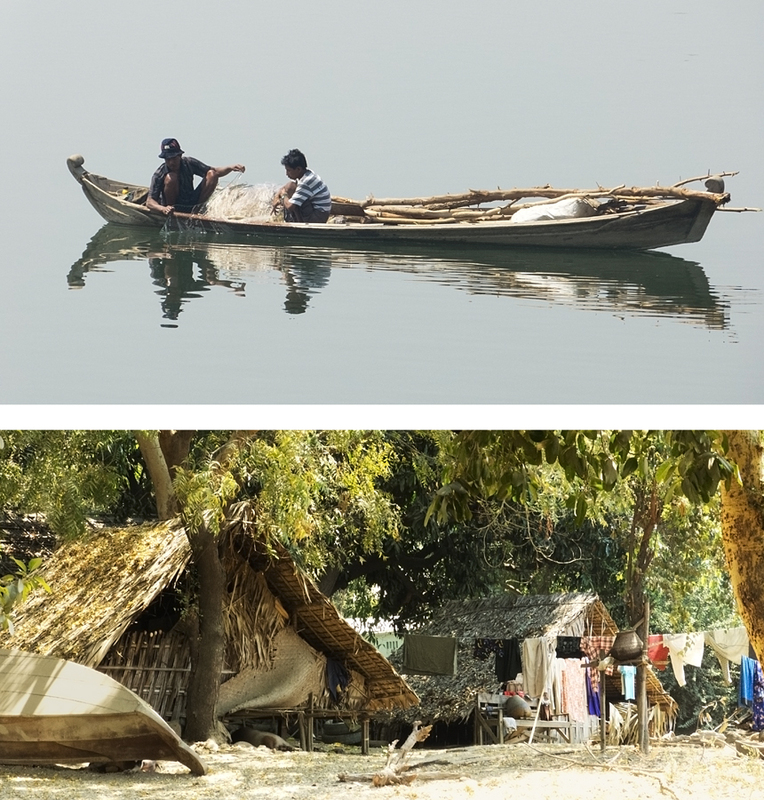 Then he took us to his father-in-law’s wooden house where he painted, and where he lived with his wife and child, only he slept in one of the thatched buildings nearby. The house was cluttered and lived in, with a dresser messy with stuff, a motorbike inside, a small generator on the floor, and in this same room he did his sand paintings, squatting down close to the ground. He was hoping we would buy one of course. 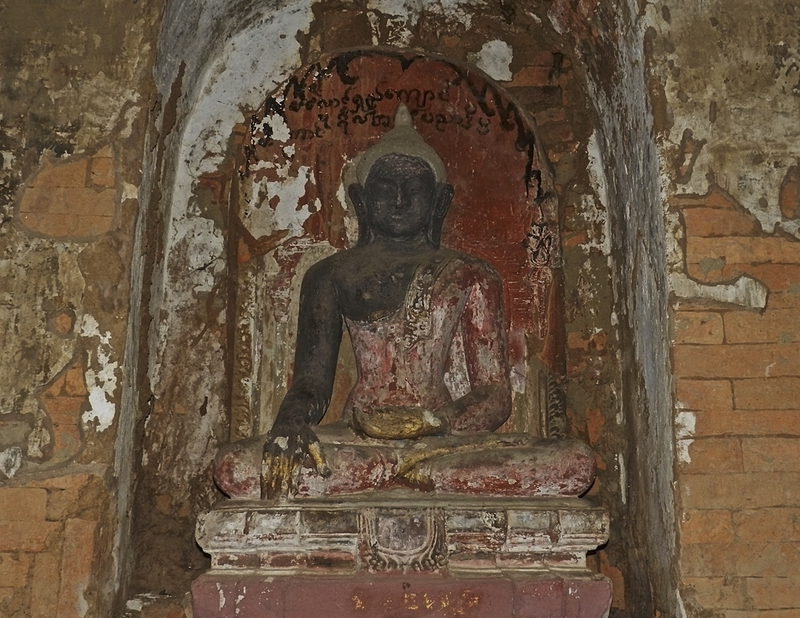 The one we wanted was the partially finished painting of the Buddha’s feet with all the traditional symbolism on it. We wanted it as a gift for dear friends in Vancouver. 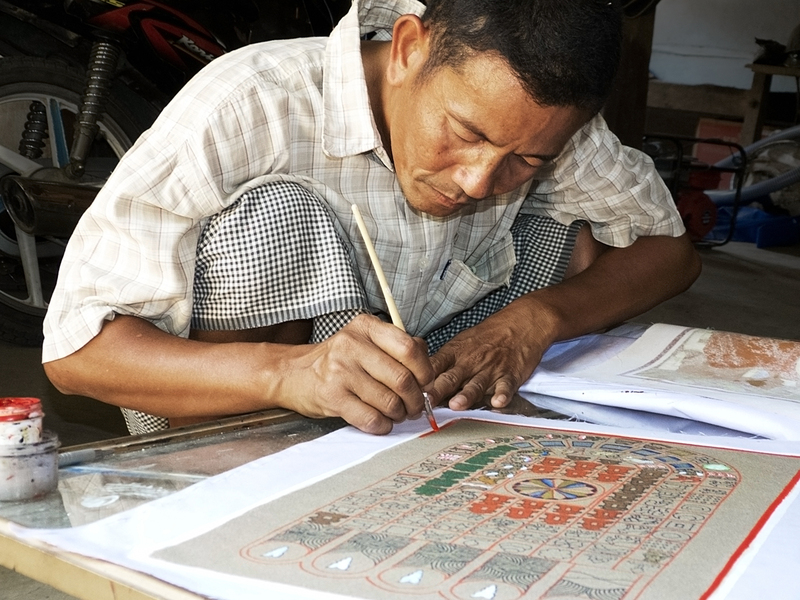 He stayed up all night to finish it and brought it to us at our hotel early next morning just before we left for Inle Lake. 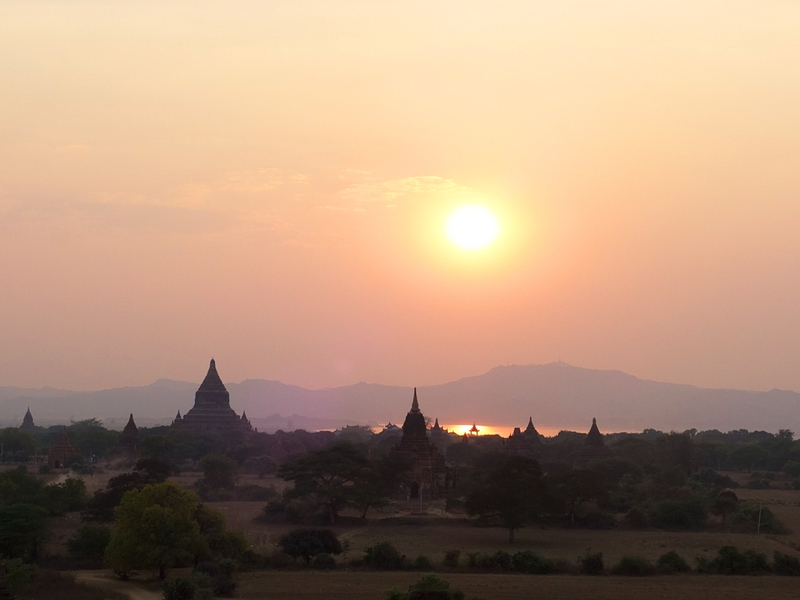 On our last evening in Bagan we climbed, just before sunset, to the top of one of the biggest pagodas. 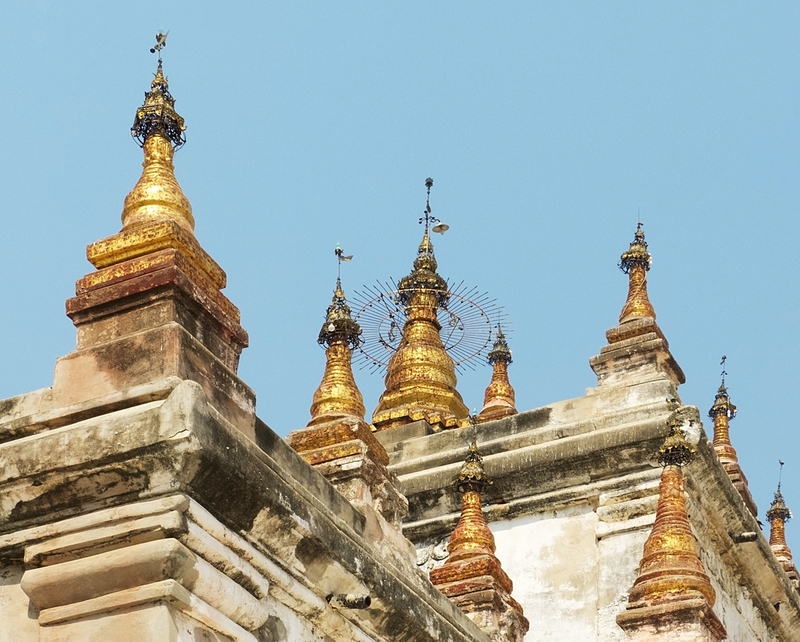 Everywhere you look, in every direction hundreds and hundreds of pagodas dot the landscape. More than 2200 temples and pagodas as far as the eye can see. It’s breathtaking, bewildering, puzzling, beautiful, a fairy tale. Who would build all these religious monuments? So many of them! The mind can hardly take it in; the sheer numbers and scale of it. 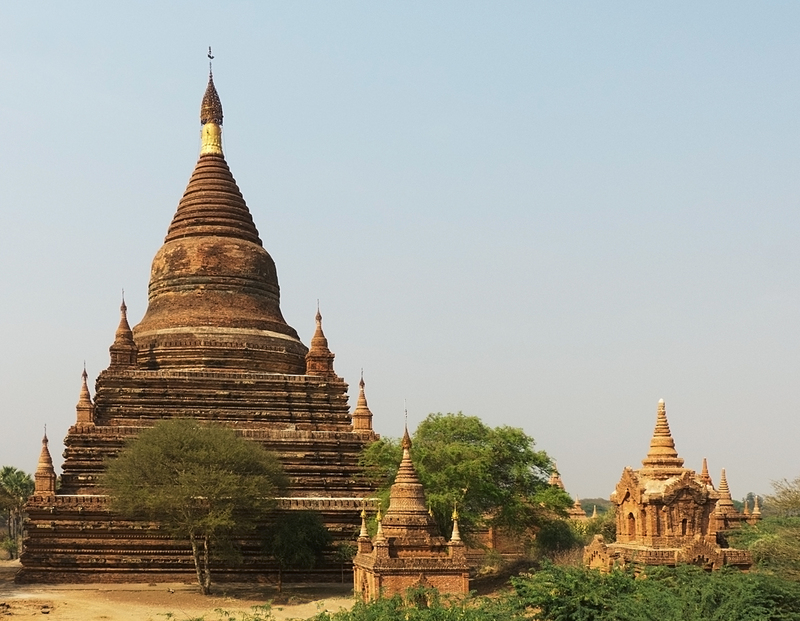 For about 250 years, between the 11th to 13th centuries, when the Bagan Empire was at the height of its power as the kingdom that unified the regions that would become modern Myanmar, its rulers and wealthy subjects built over ten thousand pagodas, temples and monasteries in the Bagan area. 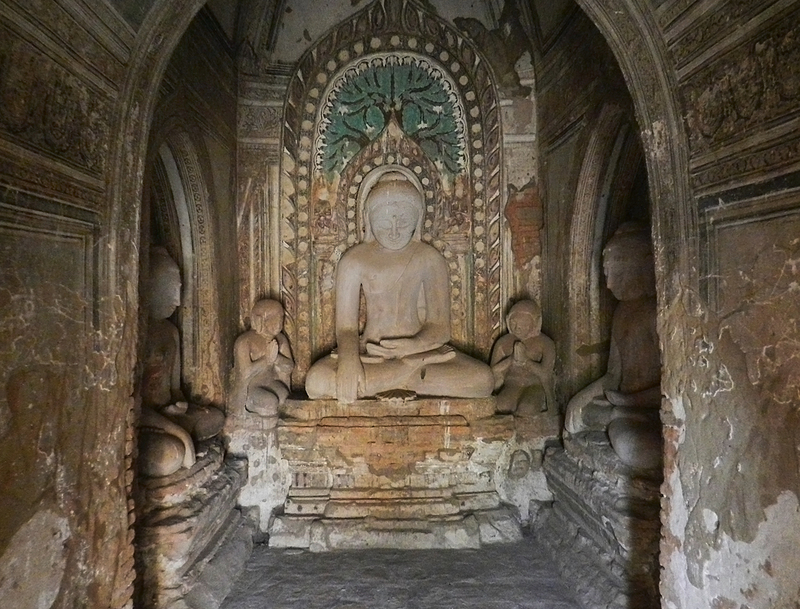 Bagan, the capital of the empire, was a thriving cultural and scholastic centre, home to 200,000 people, and religion was a dominant force encompassing various schools of Buddhism, Hinduism, and animism (Nat, or nature spirit, worship). Of those ten thousand temples, pagodas and monasteries, mainly due to earthquakes, “only” something over two thousand remain. Well let me tell you, two thousand is plenty. Two thousand is mind-boggling. I can barely conceive of ten thousand. Several of the temples have been in continuous use and so are well maintained, many are not much more than a pile of rubble, but most dot the landscape like something from another world, both insistent and ethereal. 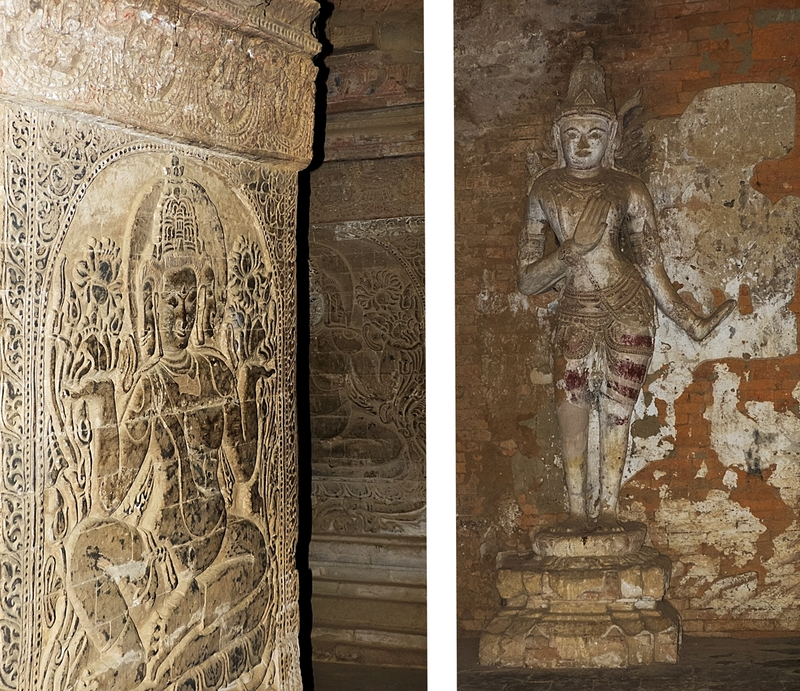 We rode around for hours from temple to temple, exploring inside and out, some of them so dark we were provided with a light bulb on the end of a long lead to carry deep into the temple so we could see the thousand-year-old murals and carvings. 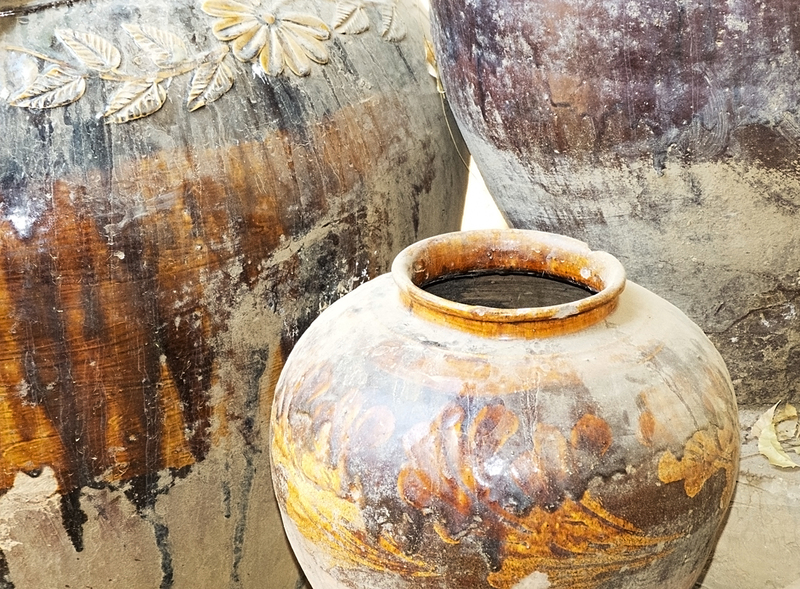 There was great variety in size, shape, architectural style, and materials, some white, some gray, most a wonderful rusty ochre, and even a pink one. A day-long exploration into another world that filled our senses with its grace and beauty. 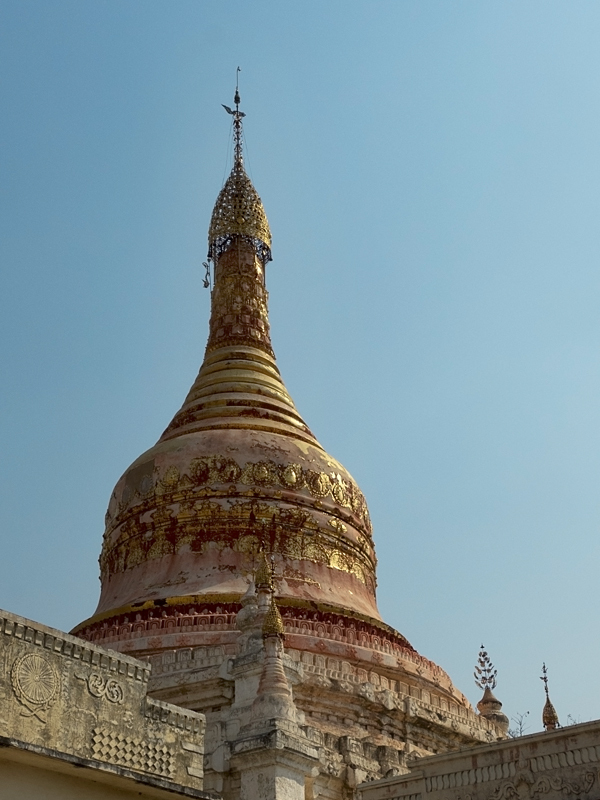 Next post: a journey to Mount Popa, the Nat/Buddhist temple at the top of a butte, and another, yes another ceremony to welcome baby (sometimes literally) monks into the monastery – on horseback! This is a great post. My niece, who is five, enjoyed the marionettes. She ooed and aawed over the costumes and tried to guess which were boys or girls. Thank you so much. Asia and the south pacific are first on my list when I am able to get out of the states. Happy Wanderings. Thank you. I’m delighted to hear your little niece had so much fun with it. Asia’s not expensive once you get there, and it’s all really fascinating. Good luck with your travel plans! What? No photo of the trishaw driver doubled over in laughter? That would be a great photo. Another wonderful set of photos. I have to ask, what camera you use, the clarity is wonderful. Camera is Panasonic Lumix FZ150 bridge with 24x optical zoom. An’ I wanna better one! There’s a new model of the same camera that retains from 2.8 to 8.0 F stop no matter what you do with the zoom which appeals to me. But also the clarity of a full DSLR appeals to me a lot, but then I have to start carrying lenses – already got enough stuff to carry around. Thanks! We have a trip in late November to Mexico, and while my Canon is ok, I may want to try something else….but nothing where I have to carry extra lenses; that’s crazines during travel. Even a true DSLR is going to be heavier than the one I have now, but if I can get away with just one zoom lens that I could use for everything I might consider it. The panasonic is great though. It’s the only make in that range of cameras that shoots raw. What a thrill it must have been to see all those t emples! And I love the picture of your 82 year old driver. Oh Kay it as amazing to see the temples. 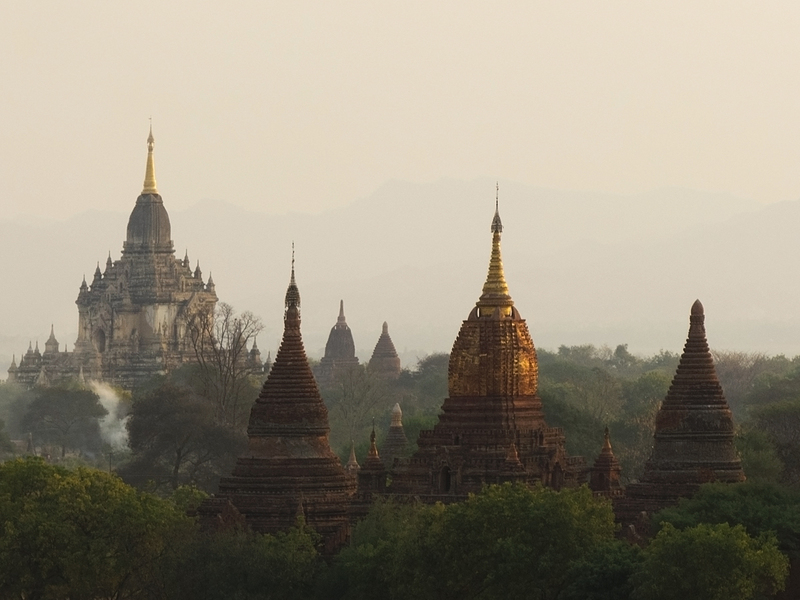 We knew there were going to be loads of temples at Bagan, but until you get there and see them, both up close, and the whole panorama, you can’t really get the impact of it. At least I didn’t anyway. I was pleased with that pic too. He was so lovely. Your posts of the temples and pagodas literally made me gasp. They’re just STUNNING! Oh my, what a sight to see ~ you captured them so wonderfully. Thank you so much. Aren’t they stunning! We couldn’t believe it. I hope I managed to capture even a bit of what it was like. It was really quite surreal. 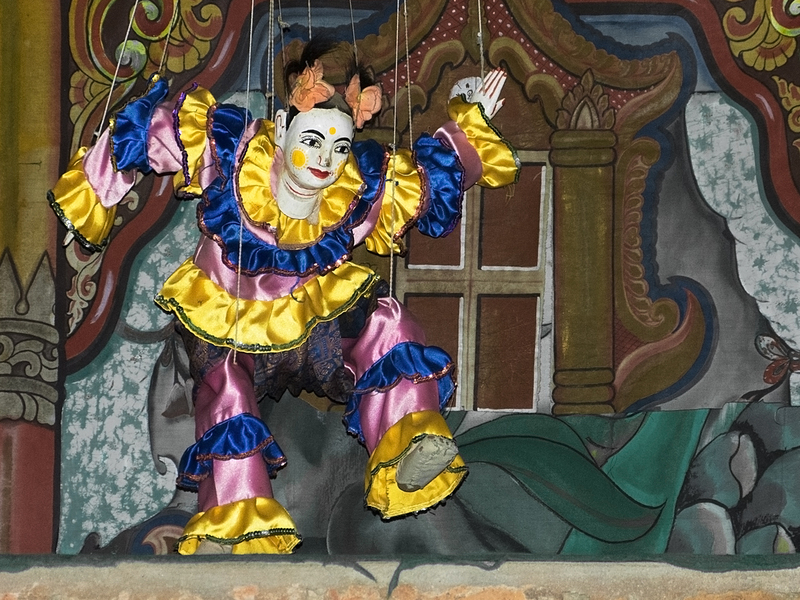 Burma’s definitely the place to see a marionette show in a far off land. They excel at it. I’m with Danny who said, “This blew me away!” Thank you yet again for another amazing post! Thanks Laurie. It really was quite mind boggling! Groan . . . .
I’m so pleased with that photo of our driver. 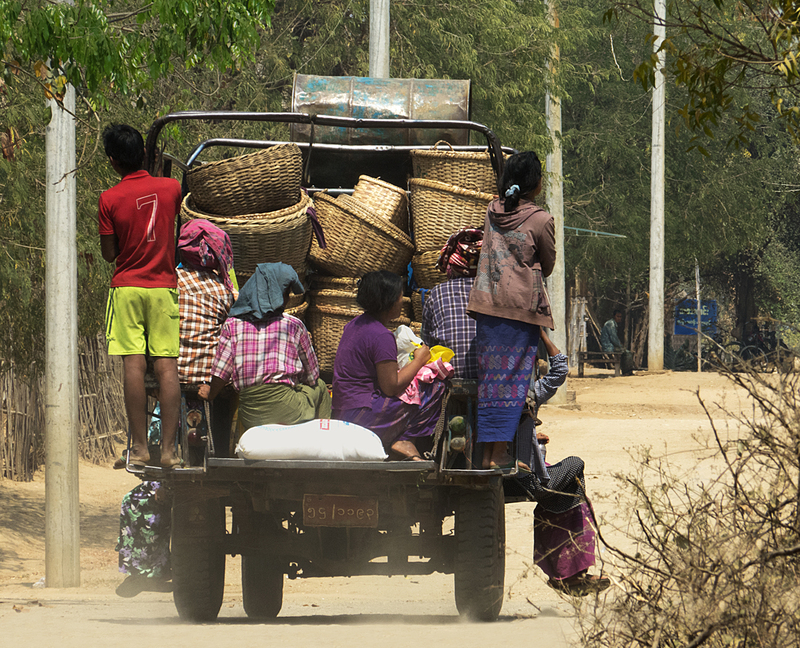 And the one of the wagon with baskets – sometimes have to be lucky to get good traffic shots. 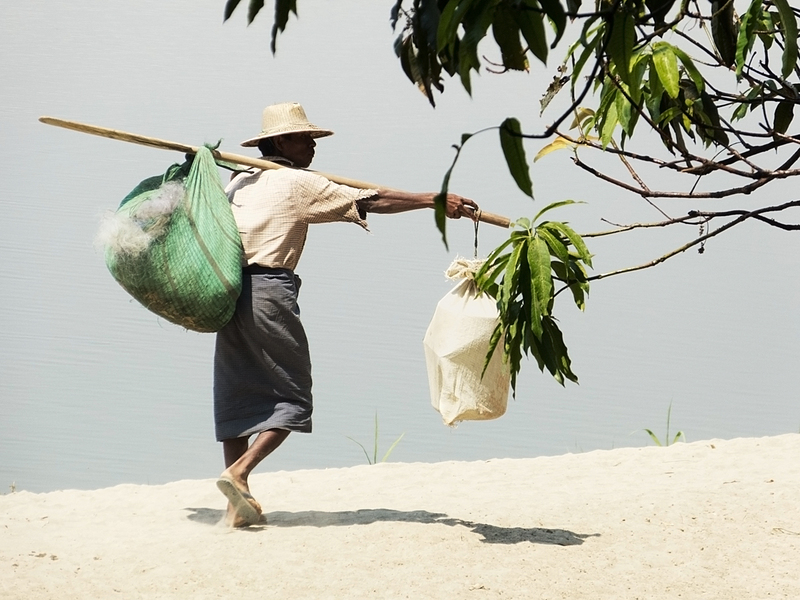 What an incredible journey–puppets, giants, 82 year old men, pagodas. Sounds like a fairy tale. The fact that the driver was imprisoned for 2 moths for having US currency is disturbing. I bet they took the money as well. Thanks Kozo. I think the fact that the trishaw driver was imprisoned for having US currency is probably one of the least disturbing things about the military junta that’s been ruling Burma for the past 30 years or so. I gather it’s been pretty repressive and brutal. Things are improving. And yeah, I bet they took his money too. 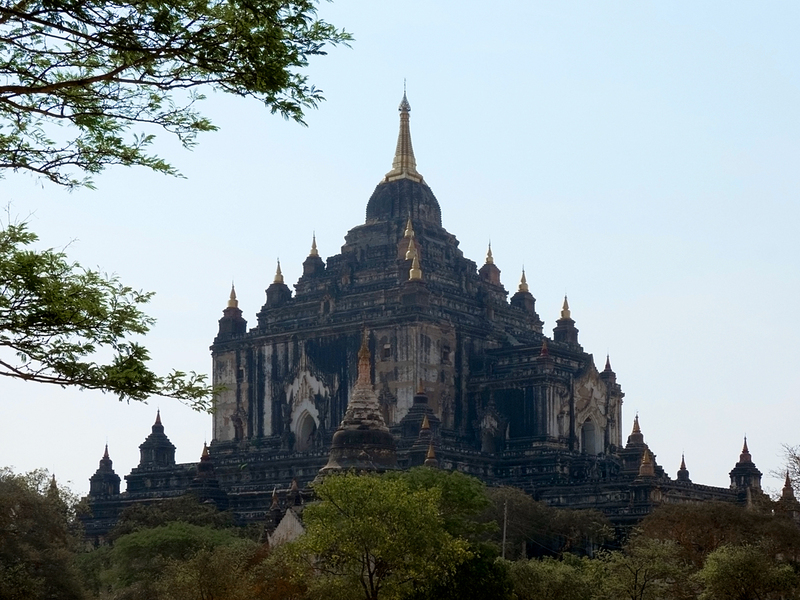 Yes it was an incredible journey – puppets and pagodas and giants. Seeing all the pagodas at sunset was really quite surreal. And the giant lady – that surely was unexpected. Probably as unexpected for us as it was for that man to have us turn up on his beach by the river. 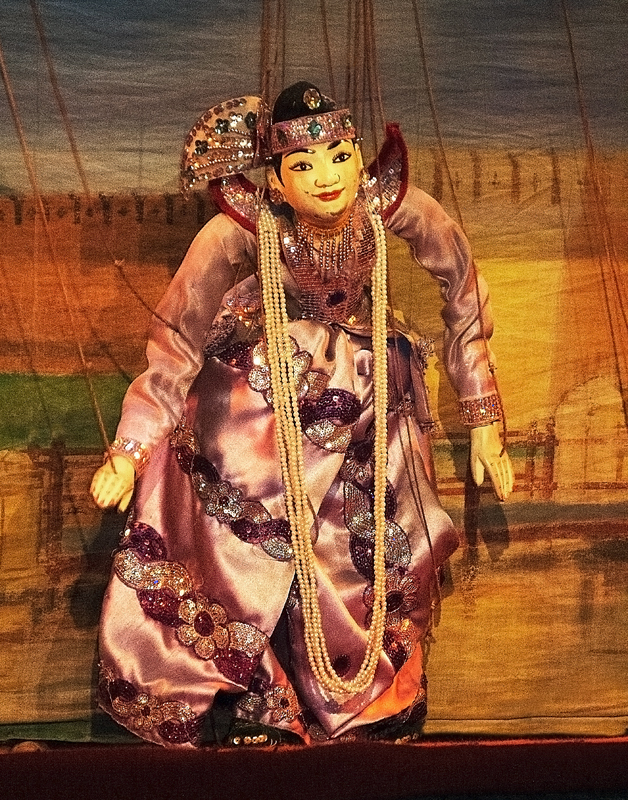 The puppets remind me so much of Bali! Oh that’s interesting. I don’t remember seeing puppets in Bali. We missed that! Aren’t those temples astonishing?! We were quite breathless with the view at sunset from the top of the pagoda. So beautiful. Yes! That’s my fav, sunset and I have seen a lot of sunsets! It”s a bit sad that some of the temples were renovated in a wrong way though. But at least we can be glad they have stopped doing that. I think they were “threatened” with losing the UNESCO World Heritage Site if they continued. Hi MightyTravels people, thanks for visiting. 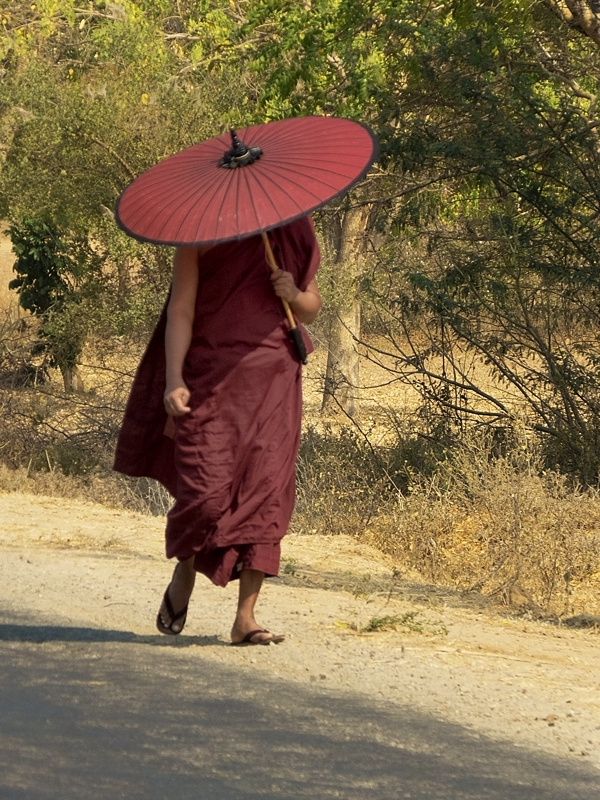 I agree, Bagan is such a special place. We loved it there, and also hope it will stay that way. We feel very lucky to have been able to go there before it changes too much though I fear the changes all over Myanmar are coming. 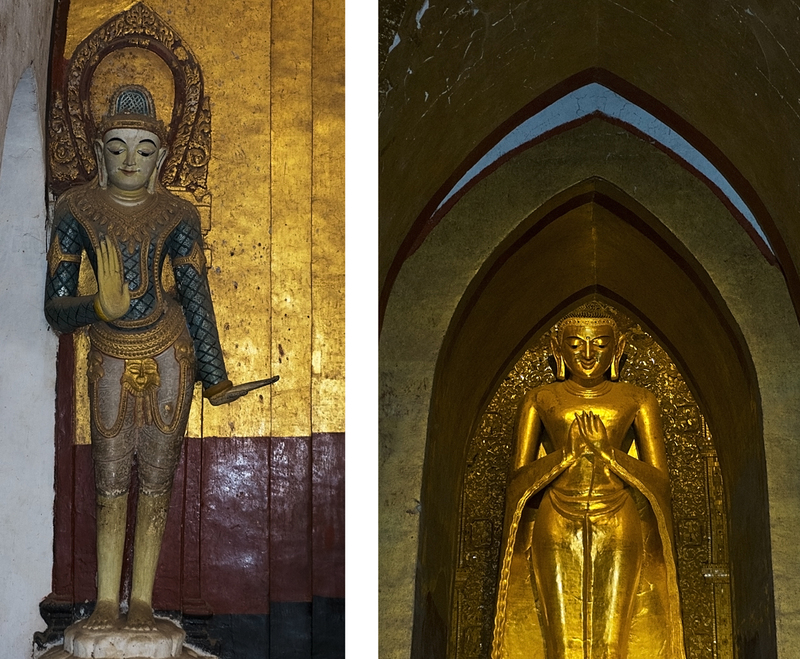 Our three weeks in Myanmar was a definite highlight of out travels in SE Asia. Your blog is full of excellent information, I’m glad to have found it. 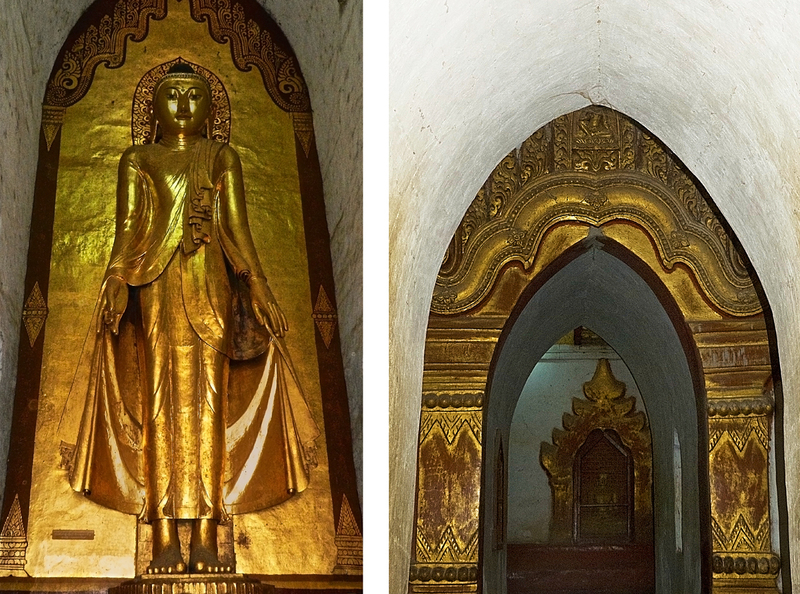 We loved Bagan, and all the places we visited in Myanmar. I hope the change is not in a bad way. Tourism can be such a blessing for the people, and also can destroy a place. I’m not sure which photo you mean – in either blog. Do you mean the fourth photo in this post? And perhaps the second of Don’s photos here? There are lots of statues behind arches. Either way I also don’t keep records and have no idea which temple is which. Worse than you I didn’t even list all the names. Dumber! yeah that one! I think it’s the same…got no clue where I was! I bet James and Bama could tell us, they seem to take meticulous notes! Did you use a flash or tripod or Don’s back? I used my iPhone!! Probably a flash. I don’t remember using Don as a tripod. Yours is pretty amazing for a phone photo!